Spread across your shingles are black streaks or fungus that seem to be crawling down the roof or exterior of my home. Black mold stains and fungus on roof shingles and exteriors have become common on houses in every price range and neighborhood. What causes roof shingles and exteriors to streak or grow fungus? What can I do to get rid of roof stains or fungus? Brothers Roofing chooses to use a chemical wash which we let nature rinse. Well explore the answers to these questions as we explore how to remove dark stains from roofs and exteriors. What are the black streaks on my roof and exterior? 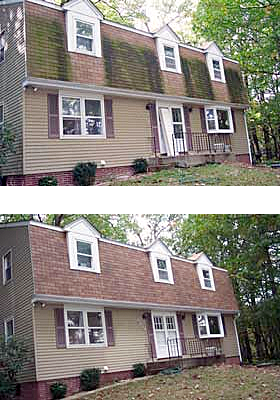 Many home owners are surprised to discover that the once clean asphalt roof shingles, siding, soffits or gutters have been slowly covered with a form of roof mold or mildew that appears as a light discoloration and spreads down the roof toward the gutters and eventually on the siding. The stains are caused by a form of algae that has been around for years, typically found in the woods on the north side of trees, or on exposed rocks; but now this algae is termed an exterior algae because of the annoying discoloration. The roof algae (sometimes called a roof mildew or shingle mold) actually feeds on the crushed limestone that is present in shingles from most asphalt shingle roof manufacturers. The roof algae is spread by wind and animals from roof to roof and eventually down the exterior of your home, is almost impossible to prevent. How can black roof stains be removed from shingles and my exterior? Our method is using a cleaning solutions and some power washing on the exterior of your home.